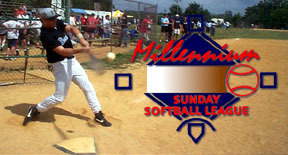 Millennium Softball Message Board: Millennium Sunday - No medical runners are allowed ! Millennium Sunday - No medical runners are allowed ! There is no such thing as a medical runner in the Millennium Sunday Softball League. You can use one (1) courtesy runner per inning in a game for this very reason. You can also use a pinch runner and then re-enter the player if you choose. As far as why some teams in the league continue to debate this doesn't make any sense. Not sure anything more than that is needed to be said.